There are lots of acid/base indicators available in the home. The one I'm going to talk about today is an indicator made from black beans. Marcelle was making a big batch of feijoada and started the black beans soaking the night before we were going to have it for dinner. As she was preparing to pour off the blue/purple water they had soaked in I asked her to save some for me. The dinner was delicious. And I decided that I'd see what colors I could come up with after dinner. In the picture below you can see the spectrum of colors obtained from my black bean juice with vinegar and baking soda. Black bean indicator: acidic on the left, neutral in the middle and basic on the right. To make your own indicator take 10-15 dry black beans put them in a test tube and cover them with water. Let them soak for 10-12 hours for the most concentrated solution. Now you can remove the water and use it as an indicator in other solutions. Dilute the black bean juice 1 part juice to 4 parts test solution. If you want to get some indicator in 10 minutes instead of 10 hours you can soak the beans in 70% isopropyl alcohol. The alcohol will make a solution much faster. 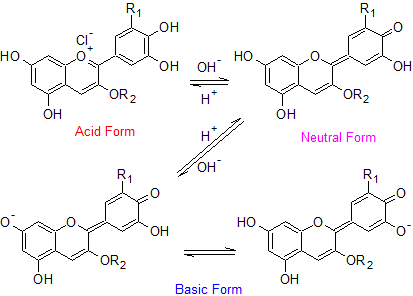 Acid, neutral, and basic forms of anthocyanins. The primary color changing molecules in black beans are anthocyanins. As the pH of the solution changes the structure of the molecule changes. This changes its absorption spectrum thus changing the color of the solution. These reactions are in equilibrium making them great natural indicators. I found that grape juice soaked into a cloth made a pretty good indicator. It turned bright blue with base and grape juice purple with acid. Grape juice is a good indicator because it too has lots of anthocyanins. I have noticed grape juice as an indicator, but never black beans. What about beets? The major coloring agent in beets is called betalain and it is a pH sensitive molecule. I have not yet played with it to see what range of colors and pHs it has.